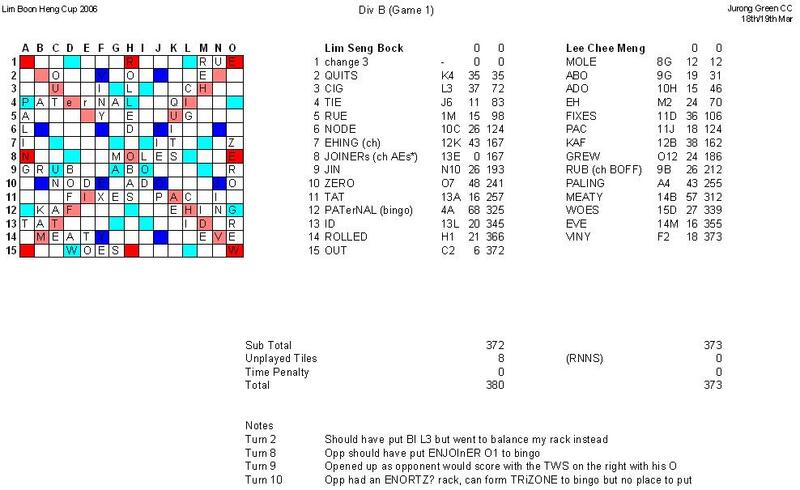 My first time playing with Seng Bock and I learnt that he was preparing for the upcoming ISBG games. Hmm, someone to look out for when our company takes part in it! 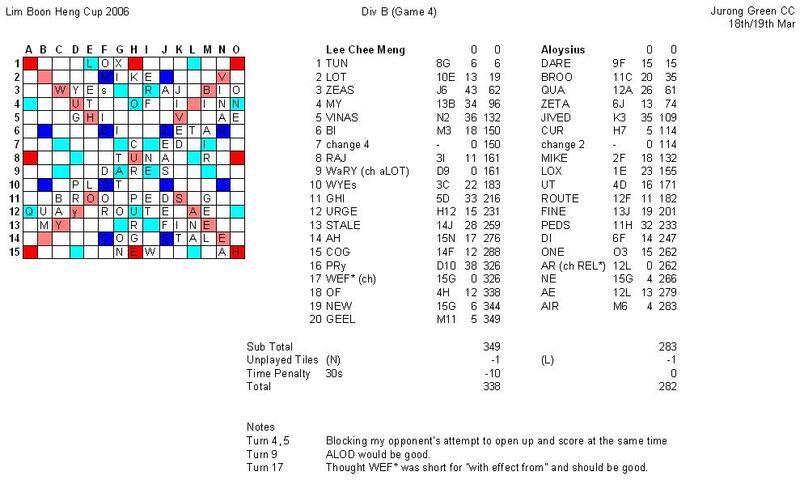 Was leading late in the game until my opponent bingoed with PATerNAL(68) using two blanks! 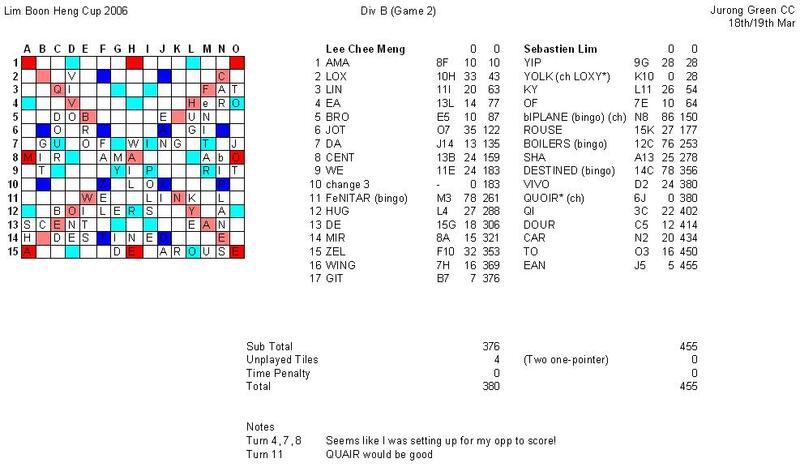 Had lots of consonants left and he finished first to add 8 points to his final score to overtake me. L 373-380, -7. 0W 1L (Accum spread -7). Sebastian is Seng Bock's colleague. Was trailing far behind when he bingoed three times in alternate turns: bIPLANE(86), BOILERS(76) and DESTINED(78)! Caught up a little bit when I bingoed with FeNITAR(78) but it was too late! L 380-455, -75. 0W 2L (Accum spread -82). Played with Arul before at the last LBH cup and I think he must be the most well equipped player in the tournament, with his own board, tiles and clock! He even had extra clocks in his bag that he wanted to sell! 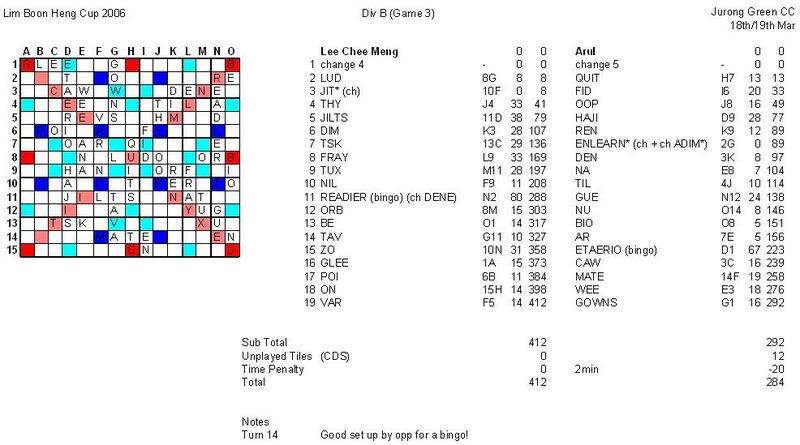 Managed to make many high score moves including a bingo with READIER(80) back hooking to an existing DEN. 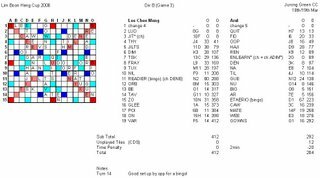 Arul bingoed late in the game with eTAERIO(67) but it was too late. 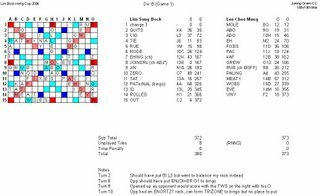 Had ABGNOOS for my rack at one time and saw the bingo in it but didn't put it down as I was not sure of it. W 412-284, +128. 1W 2L (Accum spread +46). 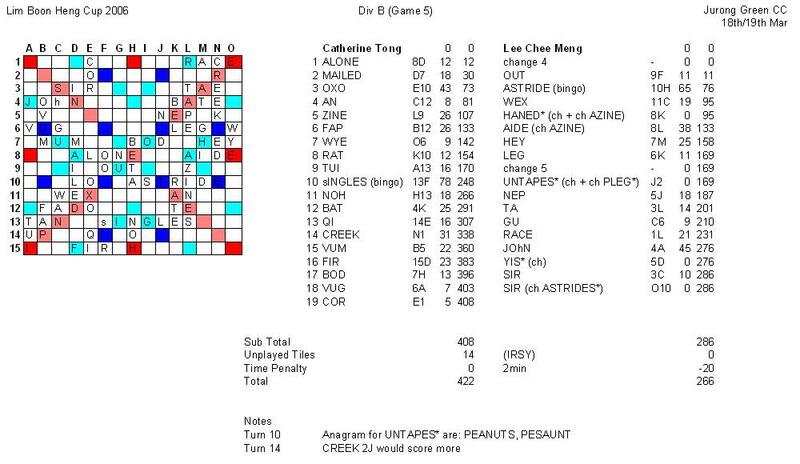 Played with Aloysius before at the last Nationals. 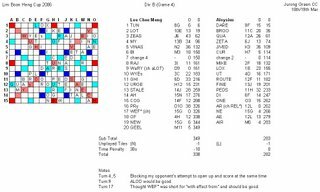 A bingoless game but I managed to make many high scoring moves while not opening up for my opponent! W 338-284, +54. 2W 2L (Accum spread +100). Played with Catherine before at the NTU open a few years ago. Bingoed first with ASTRIDE(65) and Catherine bingoed later with sINGLES(78). 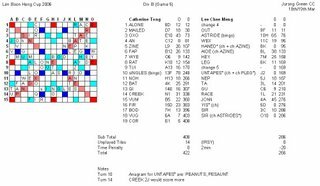 Had AENPSTU on my rack at one turn but missed the two possible anagrams and put UNTAPES* instead that was challenged off! After that, I made many low scoring moves that did not help to open up the board and lost badly in the end. L 266-422, -156. 2W 3L (Accum spread -56).